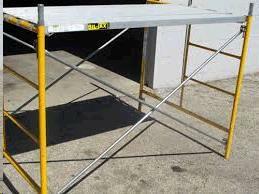 SCAFFOLD PLANK 7 FOOT ALUMINUM Rentals Ft. Collins CO, Where to Rent SCAFFOLD PLANK 7 FOOT ALUMINUM in Ft. Collins, Wellington, Greeley, LaPorte, Loveland, Windsor CO and all of Northern Colorado. ALUMINUM SCAFFOLD PLANK, HOOKS ONTO THE FRAME AT EACH END. THREE PLANKS MAKES A PLATFORM ON TOP OF THE 5 FT FRAMES. 7' LONG X 19 1/4" WIDE, MAX CAPACITY 832 lbs, 75 lbs per sq ft.
* Please call us for any questions on our scaffold plank 7 foot aluminum rentals in Fort Collins, Wellington, Greeley, LaPorte, Loveland, Windsor CO and all of Northern Colorado.